The feast day of St. Thérèse is coming up! Her feast is celebrated on the 1st of October and on the 3rd of October on the Traditional Calendar. The novena for her intercession can be said anytime, but we will be praying this particular novena in anticipation of her feast, ending on the eve of the Feast (Sept 30th or Oct 2nd). There are many different options for praying novenas to St. Therese. . . Last year, on the nine days leading up to her feast, we prayed this Nine Day Novena. 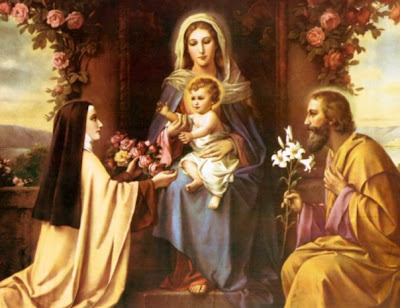 "Father Putigan, a Jesuit priest, began the Novena to Saint Therese of the Child Jesus on December 3, 1925, asking the glorious Saint for one great favour. For nine days, he recited the “Glory Be” 24 times thanking the Holy Trinity for the favours and Graces showered on Saint Therese during the 24 years that she lived on this earth. The good father asked Saint Therese that as a sign that his novena was being heard, he would receive from someone a freshly plucked rose. On the third day of the novena, an unknown person sought out Father Putigan and presented him with a beautiful rose. Father Putigan began the second novena on December 24 of the same year, and as a sign, asked for a white rose. On the fourth day of this novena, one of the Sister-nurses brought him a white rose, saying, “Saint Therese sent you this.” Amazed the priest asked “where did you get this?” “I was in the chapel,” said the Sister, “and as I was leaving, I passed the alter above which hangs the beautiful picture of Saint Therese. This rose fell at my feet. I wanted to put it back in the bouquet, but a thought came to me that you should have it." Lovely. We will be united in prayer. Thank you for reminding me about this, Jessica. just in time! Thank you for reminding me to begin my novena! You are awesome!! I've been running a L/F group for many years and was so happy to come across your website a year ago! Keep up the wonderful work you do for our Lord and His church! !